It is time for a reversal on overwintered colonies. The purpose of a reversal is to give the queen more room to lay. Without a reversal the bees are reluctant to expand their brood nest. Expanding the brood nest will help get the populations up for a divide in May. To do a reversal. If the hive is two deep boxes just rotate the boxes. Bottom to top, top to bottom. If it is a three box hive. I like to move the bottom to the top and then move the other two boxes straight down. The pollen patty should be where the bees are. Sometimes a patty has to be in two places between boxes and on the top box. This assures that the bees always have pollen available. There has been a change in the date for the second delivery. I know this may impact some beekeepers. Get back to me if this is a problem for you. This is a week earlier than what I have been telling beekeepers. Oxalic Acid has been approved in the United Sates for Varroa mite treatment. More information about this new approved mitecide in the near future. Oxalic acid is inexpensive to use and easy to apply. The mites cannot get resistant to it. 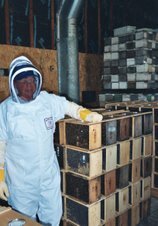 Oxalic acid can be applied usually by drizzling a predetermined amount on the bees in the colony or by fumigating the colony with a specific size dose on a 12 volt hot plate stuck in the entrance of the hive. This is a power point from Europe where Oxalic Acid has been used for years. We will not need a prescription from a Veterinarian and we will not be going to jail for two years. As the conclusion of the power point demonstration says. This is the oxalic acid summery by Randy Oliver. He wrote this article several years ago. He stresses safety and accurate doses of Oxalic Acid to have the proper outcome. He also talks about formic acid and ApiGuard. The next few months more information will be coming out on proper dosing and applications. Wendy and I went on a road trip to Wabasha and back up through Prescott, WI and home. I found when I hit Cottage Grove heading south, springtime allergies hit me. By the time we got to Wabasha, I couldn't catch my nose because it was running so bad. Soft Maples were bursting out south of the metro. Down in Wabasha they are a easy a week ahead of northern Washington County. We did see blooming trees up to about Hastings/Cottage Grove area. But it quickly fell off to bare branches from that point north. We did see about 30 Eagles in flight and on the ice and an Osprey sitting in a tree. Our weather has gone back to a more seasonal temperature outlook. The cooler weather will hold back the expansion of overwintered hives slightly. Which is good. 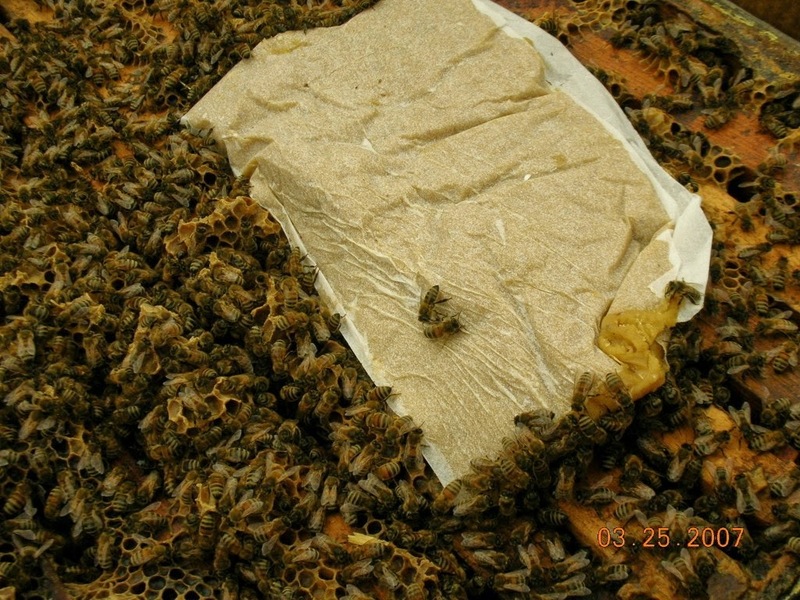 A beekeeper wants to have the colony packed with bees by early May not mid April. Swarming issues are not there at all because there are no drones in the hives to speak of, as of now. The cooler weather will tighten the bee cluster slightly but the bees will be moving around the top box quite easily. The brood area may grow a little slower as the bees need to cover the new brood much more than when the temperatures are in the upper 60's. But the normal temperatures will still let the bees move forward with an increasing hive population. Pollen patties need to be put on and checked every 10 days or so. Without a reliable source of pollen the bees may stop rearing brood, So beekeepers have to check their pollen patties and replace as necessary. Natural pollen is not really available yet and the cooler weather may slow this down. But there should be some in the near future. The problem is, if it is too cool for the bees to forage, they will not be able to collect pollen. If the daytime temperatures warm into the upper 50's the bees may only have a small part of the day to forage. The resulting pollen will not be sufficient to keep a colony going. I usually keep pollen patties on until June 1st to make sure the bees have all the pollen they can use. Feeding still is an open option. If the top box is light in total weight, feed. If the top box is heavy, don't feed. Care is needed not to overfeed. We want to give the bees enough feed to flourish, too much feed can hurt the hives springtime population by leaving the queen no where to lay eggs. Mid March is a time to be patient and not get too far ahead of the weather. I left my winter covers on because I saw this cooler trend coming. Around the first of April I am planning on removing them and do the first reversal of the season. We are sold out of package bees for 2015. I do have some orders I have not processed yet. they were included in my count. Individual queens will be available starting late April. When you have a dead colony, it is best to clean it out before it warms up. First look where the cluster is and try to determine how they died. Starvation normally looks like a bunch of bees dead in the cells with their butts looking out at you. If all the bees were gone, it was varroa. If the cluster was separated it could have been a virus. One reason they can die is having an old queen. A beekeeper should never run a queen through more than one winter. Clean out any loose bees, use a bee brush. Clean off the bottom board. Bring a box with you to put the dead bees in. Don't leave the debris near your hives. It can draw skunks. Also the debris will make the grass grow faster and you will have to cut it more. When you are done cleaning it out. Seal up and entrances to keep other bees from robbing your honey that you can feed to a package or a divide. Bees need to touch the pollen patty. Leave the wax paper on both sides of the patty. It is almost time to put on pollen patties. Anytime starting this weekend should be OK. Always put the patty where the bees are. The bees need to be touching it. They will not travel much of a distance to get it. A strong overwintered colony should get a full patty and may eat it all in ten days. Once pollen patties are put on the hive they need to be replaced before they are all gone. The bees will increase brood production and they will need the pollen. If they bees have not moved up, the pollen then needs to go between the boxes where the main cluster is. Feeding. Feeding can be done now if the bees need it. Do not overfeed. The bees will plug the hive with syrup if the beekeeper keeps feeding pail after pail of syrup. This will leave no place for the queen to lay. and will impact the hives population. Lift up the top box off the hive. If it feels light feed, if it feels heavy don't feed.